Neoliberal reforms and globalization have deeply transformed the state and set in motion a momentous shift from 'government' to 'governance'. Governance entails a move away from traditional hierarchical forms of organization and the adoption of network forms. It also entails a revision of the relationship between state and civil society in a more participatory direction. Governance is finally said to be responsible for shifting the emphasis away from statute law to more flexible forms of regulation and implementation. The state is thus claimed to be superseded by a 'networked polity' where authority is devolved to task-specific institutions with unlimited jurisdictions and intersecting memberships operating at sub- and supra-national level. This volume brings together a representative sample of the key articles that established governance as a major field of research and helped clarify the main critical issues to be addressed by those involved in research and teaching in this area. 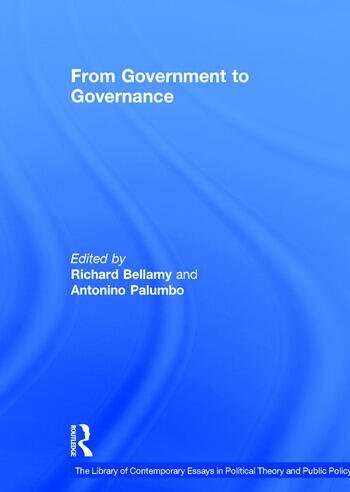 Contents: Introduction: governance: meanings, themes, narratives and questions, Antonino Palumbo; Part I Meanings, Themes and Narratives: The new governance: governing without government, R.A.W. Rhodes; Self-governance as a mode of societal governance, Jan Kooiman and Martijn van Vliet; Tipping the balance: autopoiesis and governance, Andrew Dunsire; Democratic governance: systems and radical perspectives, Mark Bevir. Part II The Rise of the Regulatory State and Network Governance: From the positive to the regulatory state: causes and consequences of changes in the mode of governance, Giandomenico Majone; Games real actors could play: positive and negative coordination in embedded negotiations, Fritz W. Scharpf; The networked polity: regional development in Western Europe, Chris Ansell; The rise of governance and the risks of failure: the case of economic development, Bob Jessop. Part III Regional Integration and the Development of Multilevel Governance: European integration since the 1980s: state-centric versus multi-level governance, Gary Marks, Liesbet Hooghe and Kermit Blank; Transforming strategic interaction into deliberative problem-solving: European comitology in the foodstuffs sector, Christian Joerges and JÃ¼rgen Neyer; The open method of coordination, Philippe Pochet; New modes of governance and the participatory myth, Stijn Smismans. Part IV Globalization and the Quest for Global Governance: Governance in the 21st century, James N. Rosenau; Neither global nor national: novel assemblages of territory, authority and rights, Saskia Sassen; Global government networks, global information agencies and disaggregated democracy, Anne-Marie Slaughter; Neoliberalism and multilevel governance, Adam Harmes. Part V Governance and Democracy Issues and Questions: Directly-deliberative polyarchy, Joshua Cohen and Charles Sabel; Democratic governance for a globalized world, Reiner Eichenberger and Bruno S. Frey; Transnational democracy, John S. Dryzek; A democratic dilemma: system effectiveness versus citizen participation, Robert A. Dahl; Name Index.